From a Fire-Fighter to a Rescue Boat Operator we can supply competent and experienced crews, with specialist vehicles and equipment to protect your personnel, premises or plant. Cover is available on a National basis, at short notice for Outdoor Events, Music Festivals, Industrial Process or Construction Projects. We operate a diverse fleet of operational fire appliances, specialising in dedicated off road vehicles ranging from Rapid Intervention Vehicles to Targeted response Vehicles. We can provide anything ranging from a Fire Warden with Fire Extinguishers to a Fire Appliance with trained and experienced Fire-Fighters. Commercial Fire Cover can be arranged at short notice, on competitive date rates and with National Coverage. Please contact us with your specific requirements for a competitively priced quotation. We operate a dedicated Swiftwater Rescue / Boat Team, with the necessary skills, knowledge, attitude, training, experience and equipment to undertake rescues in both swift and still water environments. This makes the team ideally suited to Flood Response and Water Salvage Operations, including the transporting of persons and property out of the hazard area. In order to ensure that our fire-fighters were provided with the appropriate level of training to safely undertake rescues in swiftwater environments, it was essential that a suitable and sufficient training scheme was selected and The Rescue 3 programme of courses was chosen. Rescue 3 International Inc. is a California based organisation that has been providing state of the art courses in swiftwater, flood, rope and other technical rescues for many years, this scheme is also adopted by the majority of Local Authority Fire and Rescue Services across the United Kingdom through Rescue 3 (UK), the UK and Irish agency for Rescue 3. All Rescue 3 courses are internationally recognised and are valid for 3 years, after which each team member will be revalidated by either attending the same course or by progressing to the next level, thus ensuring the skill base of our team is suitably maintained. The minimum entry requirement to our Swiftwater Rescue Team is Rescue 3 Swiftwater Rescue Technician Unit 1 with selected members of the team progressing to Swiftwater Rescue Technician Advanced, additional role specific training is also provided which includes Swiftwater Rescue Boat Operator and Rescues from Vehicles in Water. This training is supplemented by scenario based training exercises, which are conducted on a minimum of a monthly basis. We are able to provide Safety Boat Cover with competent and experienced operators and crew for a wide variety of applications. Safety Boat Services can be arranged at short notice, on competitive day rates and with National Coverage. To reduce the demands placed on Local Authorities for flood pumping and salvage we are able to assist in the provision of this service on a third-party basis. We have a wide range of pumping equipment with sizes capacities up to 4500 litre per minute. Not only are we able to assist with the pumping out of properties, but also the removal of valuable items and personal belongings. This service is available both stand alone or in conjunction with our water rescue and boat team. Our Water Rescue Team can be available at short notice for flood rescue or to assist in mass evacuation of isolated areas or vulnerable people, both as a response or preventative measure. The team can also be available to provide welfare checks on those who refuse to be displaced allowing Local Authorities to maintain their rescue efforts. 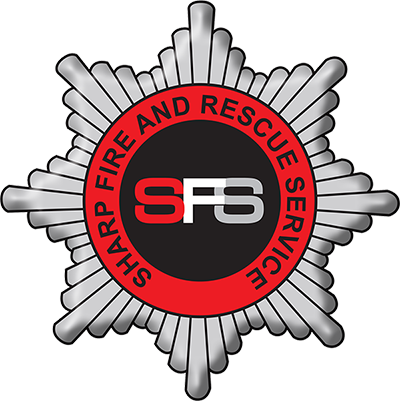 Sharp Fire & Rescue Service are able to undertake Service Level Agreements (SLA’s) with local Fire Authorities, Civil Resilience and Emergency Planning Departments, or response to individual incidents with a mobilisation request to undertake a multitude of specialist services or for the provision of specialist equipment. With its huge load carrying capacity, and carrying its own Moffett Forklift, our Incident Response Unit can be made available at short notice for the moving firefighting equipment, humanitarian aid, emergency aid, disaster relief, or medical supplies in bulk safely and more importantly efficiently. The size of this vehicle can reduce the number of journeys traditionally made without the consideration for a dedicated vehicle for the loading and unloading. We have a number of purpose built off road fire fighting vehicles which can be used at incidents with difficult access for normal domestic appliances, or where resources are required elsewhere. These vehicles come with drivers and crew. We are able to assist in protected and large scale incidents, meaning local resources can be released from the fire ground and able to respond back into the community. We also have a number of both high and low pressure tank and pump sledge units available. These are completely self-contained including basic forcible entry tools and water replenishment equipment. These can be made available on unmarked 4×4 pickups with prior notice both with or without crew, or can be delivered in bulk at short notice with our IRU. These are available to local authority, civil contingency and emergency planning for severe weather conditions such as heat waves, or for prolonged incidents, or incidents where there are severe vehicle access problems. A full hand over on their use will be given upon delivery and delivered on our IRU, they will be loaded onto your vehicles with our Moffett forklift.